Even in small, traditional theatres that use no multimedia technology or automated rigging, theatre electrics still plays an important role. 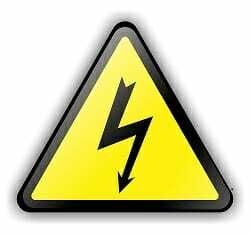 This means that electrical safety is vital. Here are a few tips on how to keep your theatre electrics, theatre, staff and audience safe from electrical hazards. Proper wire organization doesn’t just look more professional, it is also hugely beneficial in keeping your theatre safe and sound. When dealing with large amounts of electrical wires, use a mesh skin, zip ties or duct tape to surround them and bring them to a power source. This will significantly decrease tripping hazards, prevent your cables from getting tangled up and save you time when you need to unplug one. Do yourself a favour and never let your wires get out of hand. One of the main situations in which electrical problems occur is when too many appliances are plugged into one outlet. Overloading outlets can be dangerous and lead to fires. Determine how much wattage your productions may require and ensure you have a power source and outlets that can handle this. Using high quality circuit protection will minimise the risk of overloads. Your theatre electrics require at least a yearly inspection to make sure everything is working properly. Even when your equipment seems to be functioning, it’s possible that a problem has occurred that could cause a short circuit down the road (and we all know this often happens at the worst of times: right before or during a production). If it’s been a long time since a piece of theatre electrics equipment has been turned on, make sure to test it first before using it. When it comes to electrical safety, don’t take any chances.